I can’t remember where it was that I first saw the Red Elvises. It was a moose lodge or a VFW or something like it around 10 years ago. I do remember liking the band’s twangtastic surf-rockabilly sound steeped in Russian shtick. It was all dudes in red who played seriously, even if they didn't act that way. Well, things have changed. The band rolled into Sticky Lips Juke Joint to help the folks at Animatus Studio celebrate 25 animated years. A party gone out of bounds ensued. 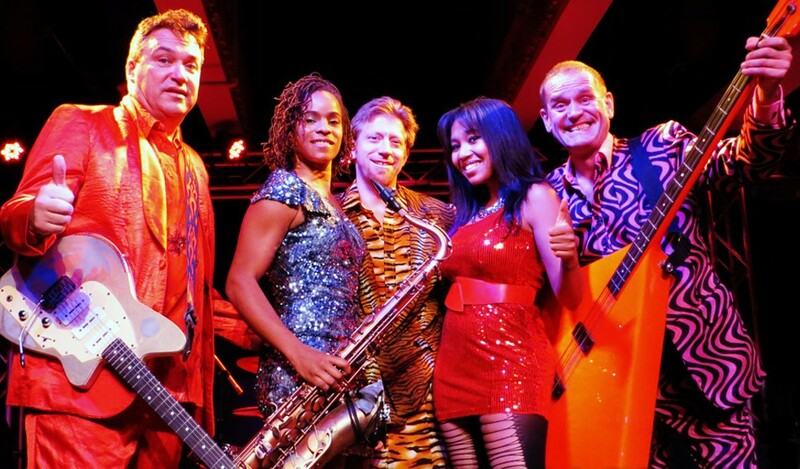 The Red Elvises is now an all-girl affair except for the remaining founding member, guitarist Igor Yuzov. The girls were decked out in various stretchy outfits like something Cyndi Lauper would wear to yoga. While reminding the packed crowd that The Red Elvises were their favorite band, Yuzov countered the girls’ threads with a silk suit that would give Neil Armstrong vertigo. So naturally, those in the crowd who were unaware initially viewed the band as a novelty. The first chord changed all that. The whole band is full of ringers, especially Yuzov who played slick and mean over a thick shag of bass drums (holy sh*t, that solo), keys, and saxophone. It was very reminiscent of The B-52’s. And though surf seemed to be a dominant factor, The Red Elvises pulled out some ska and power house jump, jive, and wail. Conga lines, spilt beer, and Animatus’ Fred Armstrong’s trademark yeti yowl made this a night to remember or is a few cases, deny they were ever there. Skol!